Before buying any stretch wrap machine you should know a few key specifications. Stretch wrap machines most commonly feature a turntable that rotates the pallet as film is applied. For this list of key specifications to consider we are focusing on turntable stretch wrap machines. We begin with standard pallet sizes and list key specifications to look for before purchasing a machine. After standard pallet sizes, view key specifications for tall and wide pallet loads. Standard pallet sizes are considered 40”x48” and no more than 60” tall. Most turntable stretch wrapping machines are made for fitting standard sized pallets. Though pallet size may not be an issue other specifications should be considered when wrapping standard pallets. Max Load Weight: Be sure the machine can accommodate the heaviest pallets being wrapped. Photo Eye: The photo eye tells the film carriage how far up to wrap the pallet. For pallets with clear or black products a special photo eye may be needed. Pre-Stretched Rollers: A stretch wrapping machine with pre-stretched rollers can obtain over a 300% stretch rate. Without pre-stretched rollers the stretch rate is limited and a pre-stretched machine film is often recommended. Turntable Drive: Knowing if the turntable is driven by chain or belt is good for considering maintenance and machine longevity. Warranty: Understanding a machine warranty and what is covered will help if things go wrong. For tall pallets in excess of 60” – 80” it is important to be sure the film carriage will reach the top of the pallet. 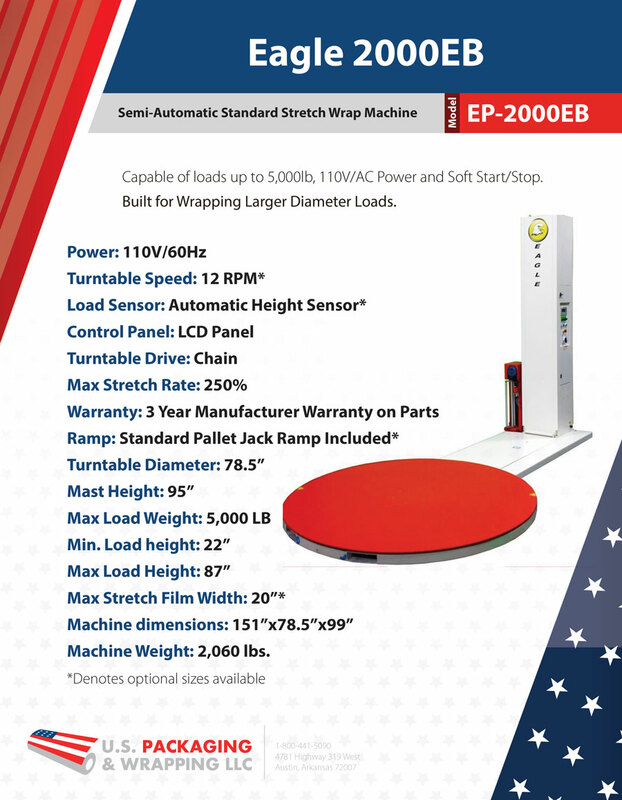 Max load height and the other specifications below are important when determining the right stretch wrap machine for tall pallets. Max Load Height: Very important machine specification when wrapping tall pallets. Be sure the machine height will accommodate the pallet. Max Load Weight: If wrapping pallets in excess of 3,500 pounds it is important to confirm the max load weight specifications. Soft Start and Stop: Tall pallets of boxes can topple when the turntable starts and stops rotation. A soft start and stop feature slowly starts and stops the turntable through each cycle. Max Turntable Speed: Turntable speed is important when wrapping tall pallets. Slow turntable revolutions can dramatically increase the time it takes to wrap tall pallets. Max Film Width: Some companies prefer to use wider stretch film for wrapping tall pallets. Be sure the maximum film width will accommodate the desired size of wrap. Wide or elongated pallets may not fit on a standard stretch wrapping machine. The best specification to determine if the pallet will fit onto a machine is the turntable diagonal. The maximum pallet diagonal is to be sure the load does not hit the machine mast during revolutions. Use a pallet diagonal calculator found here to be sure your pallet will fit onto the machine you are buying. Maximum Pallet Diagonal: The pallet diagonal is the measurement diagonally from corner to corner on a pallet. The pallet diagonal must be smaller than the machine max to ensure it does not hit the mast during the cycle. Turntable Diameter: The diameter of the turntable is important for wide pallets to be sure the load will fit on the machine. 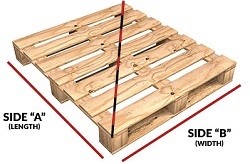 Some larger pallets have feet or braces on the bottom of the pallet that must be supported on all sides. Photo Eye: Wider or longer pallets often have products other than boxes on them. For elongated pallets, there may be gaps or empty spaces within the pallet. These gaps will cause a standard photo eye not to function properly. Understanding the photo eye specifications for the machine is important in determining the right option for the pallet load being wrapped. 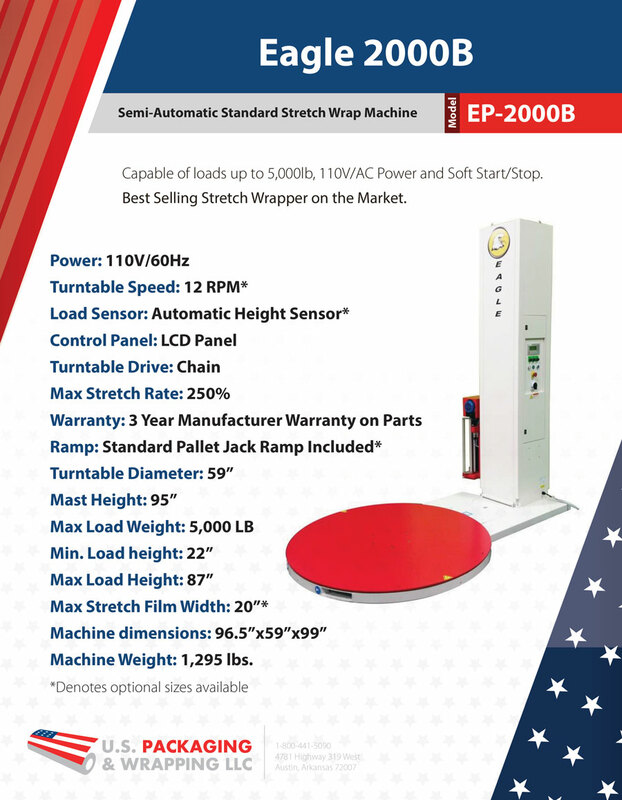 Standard stretch wrap machines are made to wrap pallets 40”x48”x60” and under 3000 pounds. Even if the pallets being wrapped fit those dimensions, there are several other machine specifications to check. Wrapping any pallets larger than standard dimensions requires more specification to be sure the right machine is being purchased. 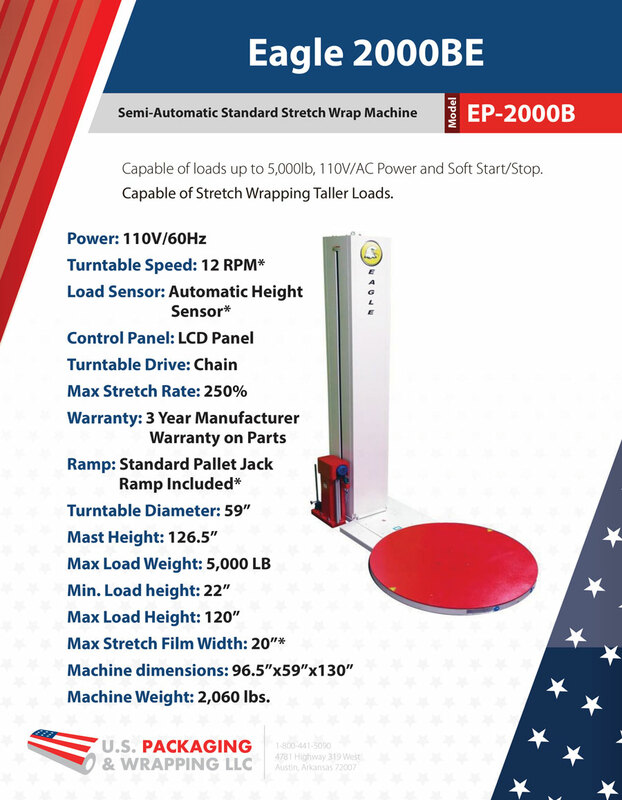 Call 1-800-441-5090 for more information about stretch wrap machine specifications and details.